Homer and Virgil sent Odysseus and Aemeas to her island shores; there they encountered harpies, Cyclops, Laestrygonians, sirens and Aeolia the God of Winds. This is a place where The Gods broker deals with mere mortals and wreak havoc upon anyone who refuses their will. When Dionysius, (Bacchus) was said to have given the first wine to man, it was on the island of Sicily that he chose to bestow his gift. First settled by tribes known as Sicani and then Elymians, the island was eventually inhabited by the Ausones, Egyptians, Phoenicians, Iberians, Greeks, Romans and Carthages. In 440 AD a Germanic tribe known as the ‘Vandals’ took over the island, only to lose it a few years later to another tribe of Germans, known as the ‘Goths’. Then it was the turn of the Byzantines who eventually lost it to the Berbers who in turn lost it to the Arabs. After the Arabs it was a realm of the Normans and then the Aragonites weighed in, before eventual reunification with Italy. Sicily is therefore a spectacular mix of many different and ancient cultures including Greek, Roman, Byzantine, Saracen, Spanish, French and Norman -each contributing to the island’s culture, particularly in the areas of cuisine and architecture. Her vines have endured through all, originally as wild bushes and eventually as cultivated treasures. Sicily is a mountainous island with a combination of fertile volcanic and rocky soils; with a warm Mediterranean climate moderated by African winds and the winds of the sea. There are a myriad of sub-regions and micro-climates, (23 recognized denominated sub-regions to date) that offer a surprising amount of viticultural diversity on the island. Sicilian wines first registered on my vinous radar many years back when I found myself overseeing a panel of young judges tasked with the adjudication of the Italian Red wine class for an International Wine Challenge. A diverse line up of reds from the northern tip of Italy’s ‘hose’, down to the southern fringe of her ‘football’ shaped island. One entry was unfortunately corked and a request for the ‘second’ bottle failed to turn it up. With only minutes to spare the ‘second’ bottle was eventually found and the wine not only took out the highest gold of the class, it went on to win 3 trophies; including wine of the show! It was, as you have probably guessed by now, a red wine from Sicily and what it had just managed to achieve was no mean feat. The wine was judged in the trophy classes amongst gold medal winning wines from all over the globe, by a host of seasoned judges and acute palates, not one of them Italian. The final piece of amazement, the wine was not produced from one of the more famous or ubiquitous ‘noble’ varieties; it was made from a then little known indigenous variety called Nero d’Avola. The wine in question was the magnificent Tasca d’Almarita Rosso del Conti, one of the islands greatest wines and now one of its most famous. The wines made from Nero d’Avola are a rich, full bodied style with the rapturous appeal and ‘specialness’ of a Christmas pudding, all dark berries, plums and brandied fruits with hints of chocolate and coffee bean, all-spice, mixed peel and vanillan oak. They have a magical, mystical quality to them and a creamy texture that swirls across the palate leaving little eddies of gratifying complexity and confection. Sicily’s wine industry today, is devoting considerable time, effort and resources into researching, reviving and cultivating some of its oldest and long forgotten varieties -at a time when international research suggests the global palate is tiring of the big name varieties planted to nearly every corner of the vinous world. Perhaps, here too, the island’s long and diverse history will play to its favour, as a myriad of revived Sicilian varieties emerge. Recently, I had the enduring pleasure of a meal at Le Residence with Alessio Planeta of Sicily’s Planeta winery, I was once again reminded, how brilliant are the wines of Sicily and how undervalued. Alessio’s Chardonnay was outstanding but, it was the indigenous varieties that were the main talking points at the table and the universal favourite at the dinner? 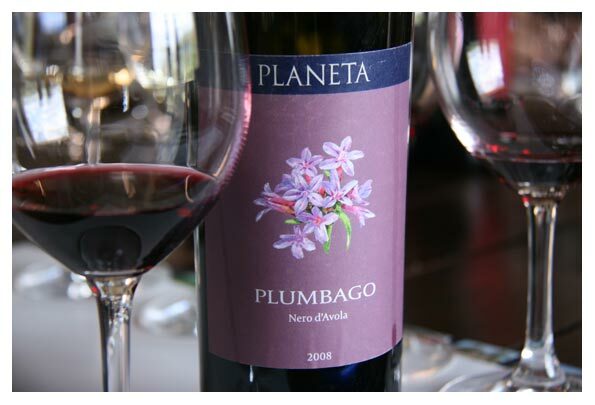 No prizes for guessing- Planeta, ‘Plumbago’, Nero d’Avola.